December 17, 2010 performance reviewed by Frances Benn Hall. If you can get a ticket for A Christmas Carol, now playing on the Unicorn Stage at the Berkshire Theatre Festival through December 30th, grab it! Now in its fifth season, and 5th version, Eric Hill, director, adapter, and a talented actor has so deeply developed his role as Scrooge that he totally inhabits it. And Charles Dickens’ tale of a miser redeemed becomes something much more. The minute shades of the man have been given as much development as one would expect in a Shakespearean lead. Here, Dickens’ grouchy hero evolves into a giddy, benevolent human being. 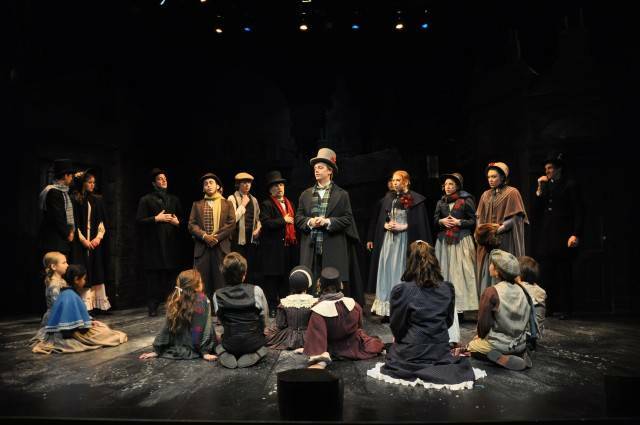 Cast of A Christmas Carol at Berkshire Theatre Festival; Photo by Jaime Davidson. Meanwhile, Hill has given his large and talented cast ample opportunities to develop and display their abilities in the gloomy, but elegant set, designed by Carl Sprague; a dour gray London replete with want and ignorance, but also with determination and even love and joy. The ninety minute production involves a cast of around thirty with ages ranging from eight upwards to experienced actors with impressive biographies. They all work seamlessly together, as the plot, whirled along by the supernatural characters who lead Scrooge through past, present, and future Christmases charm us with song, or sweep us into their grief. The many scenes are woven together and the production flows effortlessly from the first solo by a young boy (whom I cannot identify from the program, but who sings beautifully) to the last moment when the child Tiny Tim (Henry Taylor) sends us home with the message: God bless us everyone. 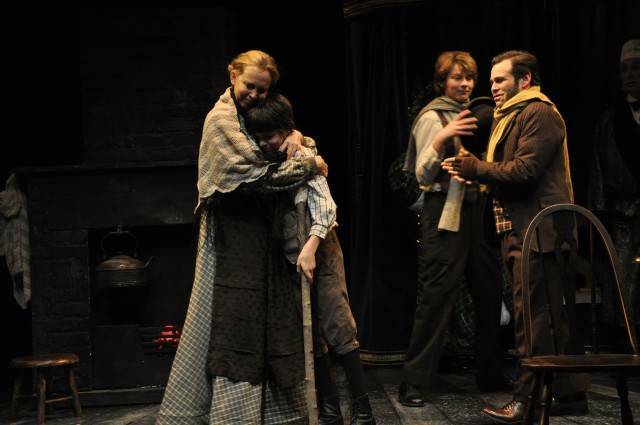 Kim Taylor, Henry Taylor, Daniel Garrity, and Mark E. Rosenthal in A Christmas Carol at BTF; Photo by Jaime Davidson. Outstanding moments for me included: Bob Crachit’s grief when he returned from the cemetery of a future in which there was no longer Tiny Tim to carry on his shoulder, a role played by Mark E Rosenthal; Ralph Petrillo’s Ghost of Christmas Present, with his gusto and seeming indifference to the pitiful children Want and Ignorance; one of E. Gray Simons III several roles including that as co-director; Marley in chains grappling with Scrooge, wearing a marvelous costume by Jessica Risser Milne; the strong family sense of love in adversity in the Crachit home lead by mother Kim Taylor whose second twin, Rufus, was an appealing younger Scrooge in a flashback. The BTF is lucky to have another family group aboard in this show as the Stantons have been in the past. The lights that fell like rain drops over the stage and ceiling at times, the sound brought in bells and gongs, the buoyant dances that accompanied the gay uplifting moments, proved that skilled theatre technicians were at work to ensure that the play ran smoothly and convincingly. It was clear that the actors loved what they were doing and wanted to please us.